A recent Census report highlights a component of pent-up housing demand — the rise of multigenerational households. Data from the 2009-2011 American Community Survey reported that 4.3 million households were multigenerational, or 5.6 percent of the total of 76.4 million family households with more than one person. 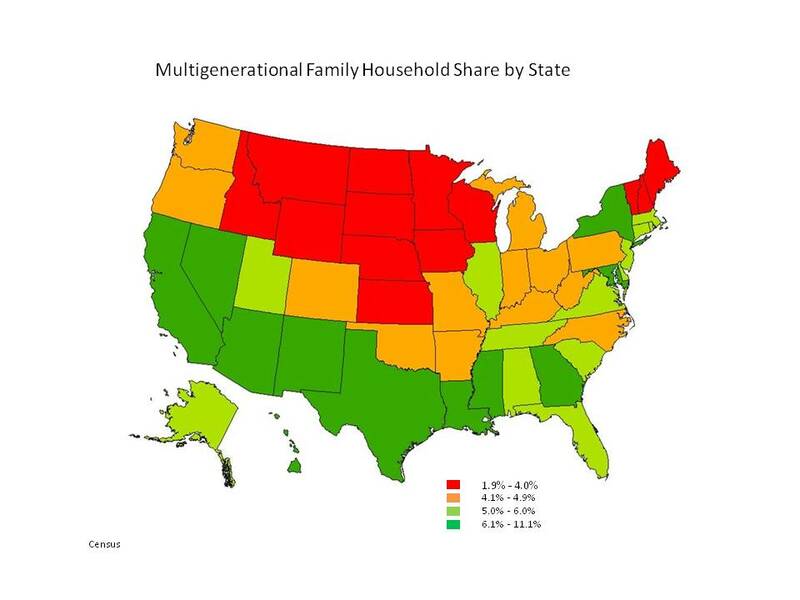 This count represents a significant increase in the share of multigenerational households from 3.7 percent of total family households in 2000 and 4.0 percent of total family households in 2010. The ACS defines multigenerational households as families with three or more generations. Some 64.6 percent of multigenerational households included a householder, a child of the householder and the grandchild of the householder. Households comprised of the householder with a parent (or parent-in-law) of the householder and child of the householder were a 33.7 percent share of total multigenerational households. Only 1.7 percent of multigenerational households were comprised of the householder plus a parent (or parent-in-law), child and grandchild of the householder. 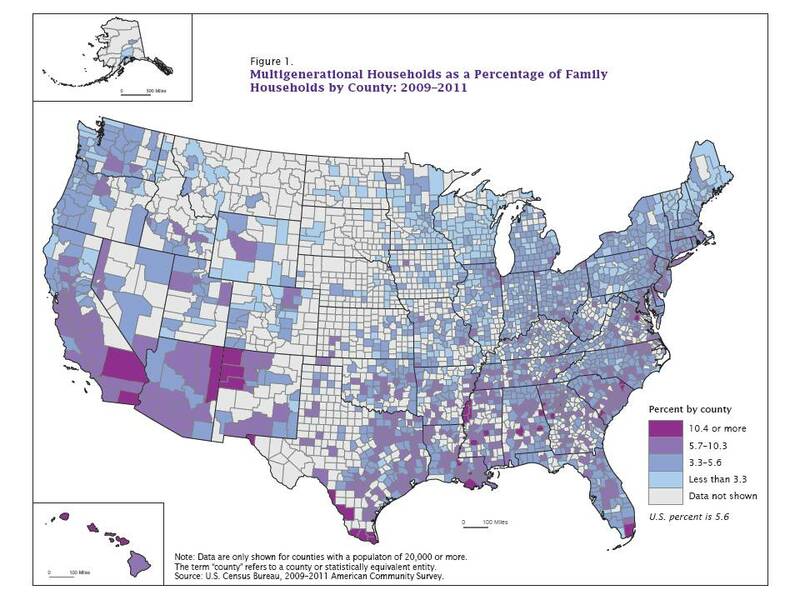 The Census report indicates a higher share of such households in the American South and the West, with multigenerational household rates of 6.0 percent and 6.7 percent respectively. The shares are 4.2 percent in the Midwest and 5.5 percent in the Northeast. 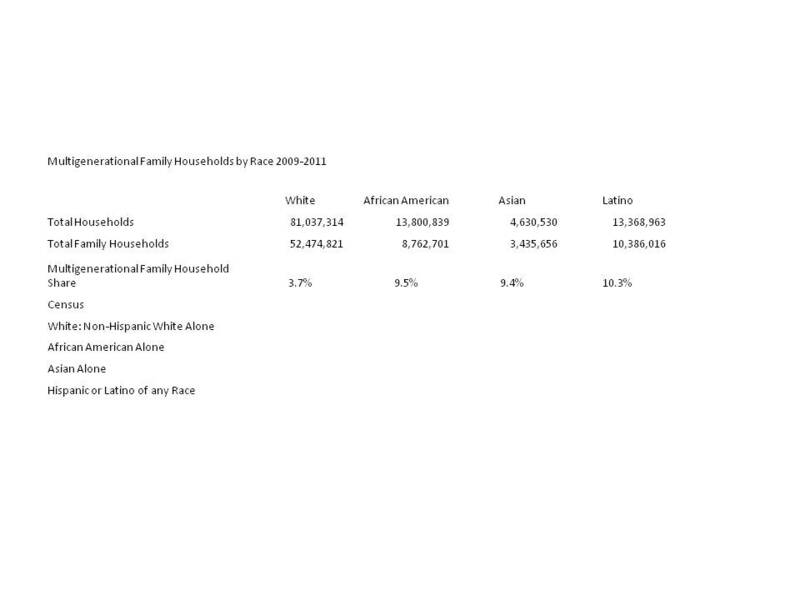 This is somewhat consistent with a previous look at households containing non-relatives. The Census reported a higher share of multigenerational Hispanic, African American and Asian households, with multigenerational family household shares of 10.3 percent, 9.5 percent and 9.4 percent respectively. These shares compare to 3.7 percent for Non-Hispanic Whites. The Census data suggest expectations that in many areas of the country, the non-majority population will drive future household formations and home purchases, with a particular need to accommodate larger, multigenerational families. An interesting long-term research question and one that builders must address in terms of servicing housing demand, is the extent to which these trends represent temporary effects from the Great Recession or long-term changes associated with a changing national population. This article originally appeared in NAHB’s Eye on Housing Blog.